It's been awhile since I shared any new recipes with you all but I've got a good one today. In a medium sauce pan, bring 4 cups of water to boil. Add the salt. Stir in orzo. Cook until according to package directions for al dente, about 8-9 minutes. Drain orzo and set aside. In a small sauce pan, saute garlic in coconut oil. Add in asparagus pieces. Saute for 3-4 minutes. Stir in spinach. 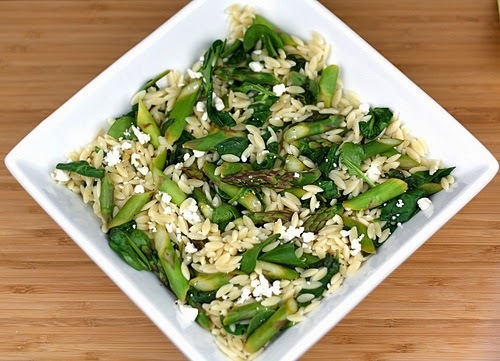 Cook until asparagus is tender and the spinach shrinks down (abount another 1-2 minutes). Put the orzo in a medium bowl and add in the vegetables. Squeeze fresh lemon juice over the orzo and vegetables. Stir. Season with salt and pepper. Taste-add more lemon juice if you wish. If you need more juice, go ahead. Sprinkle feta cheese over the top of the salad. Serve warm. I hope you enjoy this salad as much as my husband and I did! Yum, love it and LOVE orzo! Like To Know It - What's The Deal?